Last Monday, I darted into the city to meet up with #designhounds to embrace what is hot on the New York design scene. I started off at a breakfast with Mr. Steam at the delicious Landmarc and then shot off to the ICFF, North America's premier platform for global design to meet up with Hubbardton Forge and Wilsonart. I enjoyed my day and noticed some overlap from brand to brand. I saw how each brand explored how the intersection of materials, design and technology can impact lives on a day to day basis. Martha, Mr. Steam's VP of Marketing spoke about how "wellness should be a way life." There are so many benefits of steam and how we designers can educate our clients to understand how steam can promote a happier and healthier lifestyle. Why not "feel good" on a day to day basis versus the sporadic 'treat yourself' weekend to the spa? 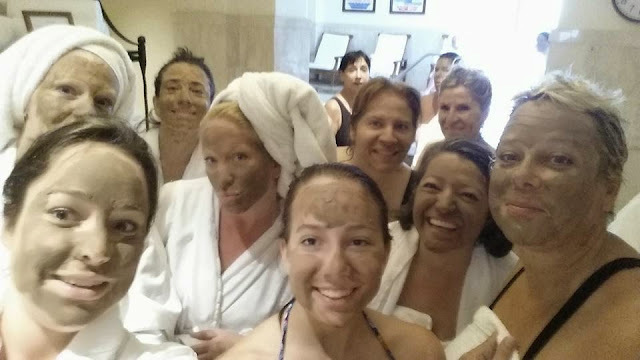 I have previously met Martha on the Modenus -Blog Tour California where I viscerally experienced the steam experience with TALA clay all over my face. I walked away understanding that there are major health and beauty advantages to steam-bathing that can fit into a well designed life. Mr. Steam's intelligent operating system iSteam offers an array of options with easy touch screen navigation: add music, aroma (aromasteam) , colored lighting (chromasteam) and/or control the temperature in your very own shower. Mr. Steams online virtual spa system makes it easy. Get a simple system or all the bells and whistles. You can see the pricing on their website as you select your options. Not only steam but also light has the ability to transform one's life. Hubbardton Forge, a lighting manufacturer in Vermont USA showcased new lighting collections that incorporate crystals and color. From the ancient Egyptian times of King Tut to the modern masters of Cartier, crystals have been prized for their beauty and their healing and spiritual properties. Light passing through crystals start a vibration within the minerals and will resonate with the faceted patterns of the crystal. I really believe that this reflection and refraction can help us to restore balance and stress in our lives. 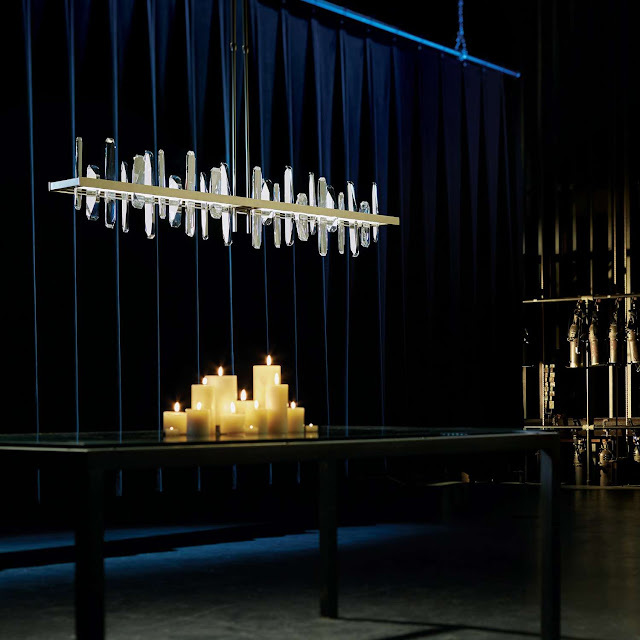 I would say Hubbardton Forge lighting is synonymous with craftsmanship where crystal design is taken to the next level. Each design is specifically crafted to display crystals like they were jewels in a jewelry setting as shown in the Artemis LED pendant above. How beautiful, right? Each crystal in the Solitude LED Pendant rises from an LED light guide so light is reflected and refracted. This pendant can be hand crafted up to 18'-0" long. What a statement this fixture makes over a dining room table!! Wilsonart, a leading manufacturer of engineered surfacing developed Wilsonart Challenges, an innovative Student Chair Competition celebrating laminate with a "borders, boundaries and mashup theme" for 2017. Each entry from the San Diego State University explores a resolution of life between extremes by using patterns from the Wilsonart Laminate collection. Grace Jeffers, a design historian and materials expert told us #designhounds that the program is incorporated into the students curriculum and there was a winner and 5 runner ups. Matthew John Bacer -winner of competition. Chair:A piece of Tlaltecuhtli. He reflects on the use of appropriation of a famous stone monolith in Mexico city. The use of and color of laminate looks like real stone. Anna Karreskog- Chair Waves- using her engineering knowledge, she celebrates the endless succession of San Diego's ocean's waves. 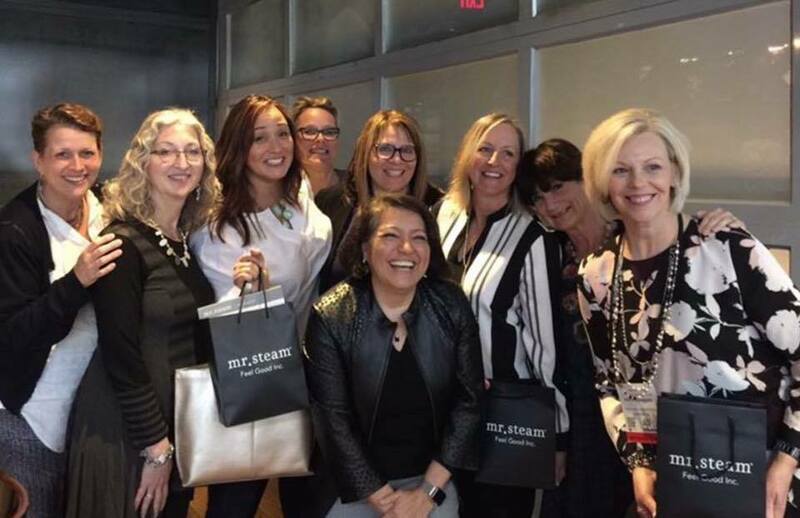 Thankyou to Veronika Miller of Modenus and #designhounds, Mr. Steam, Wilsonart and Hubbardton Forge for a great day! !